Carter's win in 2012 began New Zealand's run of awards which was continued by Kieran Read in 2013, Brodie Retallick in 2014, Carter after the 2015 World Cup and Barrett last year. 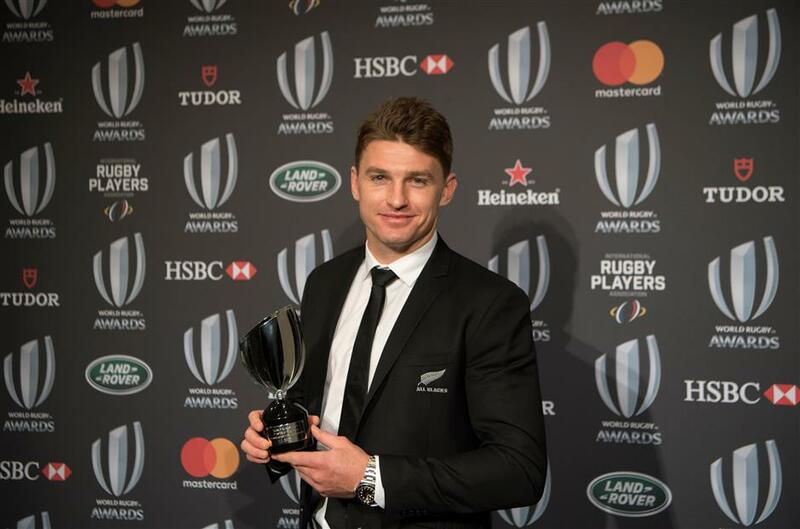 Player of the Year Beauden Barrett of New Zealand poses with his trophy during the World Rugby Awards in Monaco on November 26, 2017. All Blacks flyhalf Beauden Barrett has been named World Rugby's Player of the Year for the second straight year, continuing New Zealand's stranglehold on the award which has been won by an All Black every year since 2012. Barrett beat teammate Rieko Ioane, Australia's Israel Folau and England's Owen Farrell and Maro Itoje to the award which was presented on Sunday at a glitzy award ceremony in Monaco. He is the third player after All Blacks Dan Carter and Richie McCaw to win the award more than once: flyhalf Carter was Player of the Year in 2005, 2012 and 2015 and McCaw won in 2006, 2009 and 2010. England's Australian-born coach Eddie Jones was named Coach of the Year, New Zealand's Portia Woodman was Women's Player of the Year, the New Zealand women's team which won this year's Women's World Cup was Team of the Year and winger Ioane was named Breakthrough Player of the Year. New Zealand's Michaela Blyde was named Women's Sevens Player of the Year and Perry Baker of the United States was Men's Sevens Player of the Year. McCaw and England's Rachael Burford won International Rugby Players' Association Special Merit Awards. The selection of Barrett for the major award was mildly surprising because his form this season was not seen to have measured up to the standard he set in his breakthrough year, 2016, when he took over from Carter in the All Blacks' No. 10 jersey. Barrett said: "I'm just one player in a great team." "I'm very proud and surprised. I wanted to be better than last year and I still feel I have plenty to go so that's very exciting." He said the British and Irish Lions, who drew their three-test series in New Zealand in July, "put us under the most pressure I've felt as an All Black. "When I hang my boots up, that's when I can look back and be really proud of this." 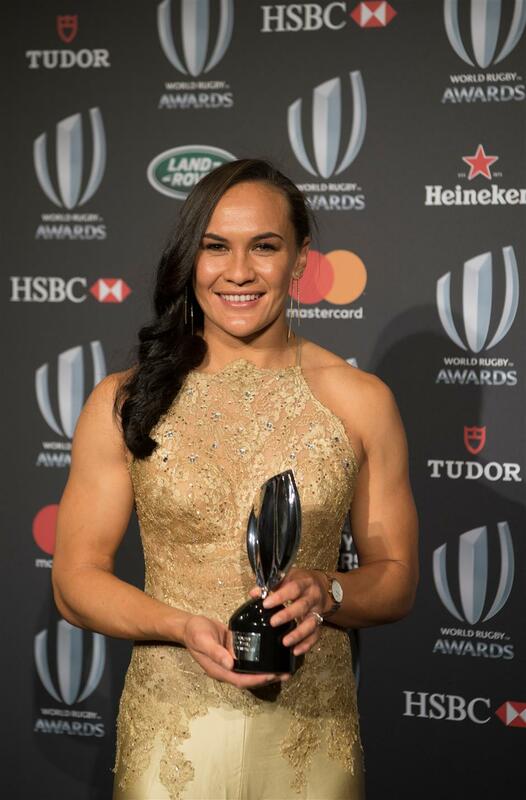 Women's Player of the Year Portia Woodman of New Zealand poses with her trophy during the World Rugby Awards in Monaco. The 26-year-old Woodman, a winger whose tryscoring form was critical to New Zealand's World Cup success, also praised her teammates after receiving the Women's Player of the Year award from Carter. "Obviously winning the Team of the Year award shows how good they are and honestly, they make me look good," she said. "They do all the work and I'm just out there on the sideline waiting for the ball." Jones received the Coach of the Year award after guiding England to the Six Nations title and to an unbeaten record in autumn internationals. "I feel a bit embarrassed because we're not the No. 1 team in the world." he said. "(All Blacks coach) Steve Hansen should be up here but someone has judged it another way. "We want to be the No. 1 team in the world and until we're the No. 1 team in the world we've got nothing to crow about. "We're getting better. We've had some good periods and not so good periods. I think we're on the right track." Asked what he would do with the award, Jones said "I think my dog will play with it."